and mechanical skill to construct these Charts. Enlarged and Revised Edition Copyrighted 1920. 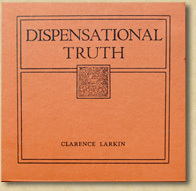 This complete digital edition of Larkin's Dispensational Truth was compiled by PreservedWords.com from various sources. The text was obtained by Optical Character Recognition (OCR) from one source and several of the charts and woodcuts from other sources. We had to scan or photograph the remaining charts and graphics from a hard copy of the book. After obtaining the raw text and graphics, we cleaned up and made thumbnails of the images, formatted the layout, and integrated the verse popups within the HTML. The compilation of this work took many hours. The pages are formatted to be very similar in appearance to the hard copy of the book. The charts and cuts (woodcut images) are generally placed where they fall within the book. The cuts, small charts, and thumbnails of the large charts are inline with the text. The large charts are accessed by links under their respective thumbnail. All chapters, charts, and images can also be accessed from the Contents page. All charts and images found within the bound copy of Dispensational Truth are included. To our knowledge this is the first complete and freely available digital edition of this valuable work. It is our hope that others will find it as helpful as we have. The total size of this digital edition of Dispensational Truth is over 12 meg. within 236 files. It is placed on the web in hope that individuals will read the truths presented in the book and learn more about the Lord Jesus Christ and his plans and purpose. We offer it freely, however, we request if anyone desires all the files of the book for their personal use, they order one of our various formats from This Page. If you appreciate our publishing this work and others like it, consider purchasing the Clarence Larkin Module Bundle (a $5 download with Six Larkin books and charts) for our Bible Analyzer Software so we can continue. We also have an HTML edition of the Larkin Books. Click the link at right for a paperback copy of Larkin's book Dispensational Truth. This paperback edition is much less expensive than the hardback.